The 20th Annual Noir City Film Festival in Hollywood featured an opening night double bill of THE BLUE DAHLIA (1946) and I LOVE TROUBLE (1948). This was at least the third opening night I've attended featuring a film starring Alan Ladd; past opening nights have featured THE GREAT GATSBY (1949) in 2012 and THIS GUN FOR HIRE (1942), shown on the bottom half of the double bill in 2012 and reprised as the evening's lead film in 2017. As a big fan of Alan Ladd, I'm delighted his work continues to command such attention! I last reviewed THE BLUE DAHLIA after watching it on DVD in 2013. Once again I found it to be a highly entertaining film, right down to faces like Noel Neill, James Millican, Frank Faylen, and Anthony Caruso in small roles. 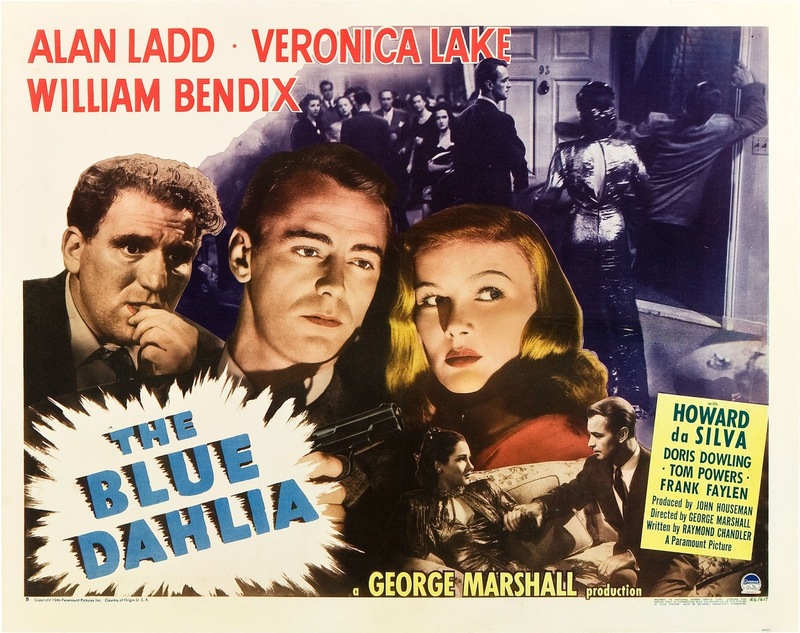 All of the films in this year's Noir City Festival are set in and around Los Angeles, and both THE BLUE DAHLIA and the second film of the night, I LOVE TROUBLE, do a good job conveying a sense of "place." The location shooting in each film isn't extensive, but it's effective, and script references to nearby cities like Long Beach add to the authenticity. 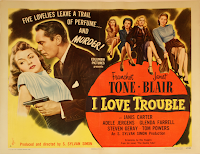 I LOVE TROUBLE was the first screenplay by Roy Huggins, based on his Chandler-esque novel THE DOUBLE TAKE. Huggins would later be known for several classic TV shows, including James Garner's MAVERICK and THE ROCKFORD FILES. Franchot Tone plays Hollywood-based private detective Stuart Bailey, and it's fun to note that Huggins would later recycle the name Stuart Bailey for Efrem Zimbalist Jr.'s character in the TV series 77 SUNSET STRIP! Character actor Tom Powers, seen earlier in the night as the police captain in THE BLUE DAHLIA, here plays Ralph Johnston, who hires Bailey to follow his lovely young wife (Lynn Merrick). Mrs. Johnston seems to have an unexceptional background, yet she's receiving blackmail letters. Bailey, aided by his firecracker Gal Friday, Hazel (a very funny Glenda Farrell), traces Mrs. Johnston's background, which leads him to Portland and meeting lovely ladies played by Janet Blair, Janis Carter, and Adele Jergens. 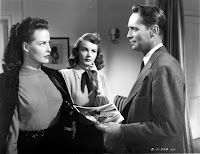 Before the film Alan K. Rode quipped that "If Joan Crawford and Barbara Stanwyck are the Four Seasons of femme fatale, then Janis Carter and Adele Jergens are the Courtyard by Marriott." The plot frankly gets a bit convoluted, especially given a couple characters' multiple identities. I was glad to note it wasn't just me who became a bit confused; some years ago Steve at Mystery File wrote "I do not believe that anyone can watch this movie and follow the plot all of the way through. It is complicated." That said, it's made up for by the terrific cast, the previously mentioned location shooting, a couple nicely choreographed car chases, and a number of good lines and fun incidents; I especially loved a dark warehouse which conceals a high-class nightclub. The supporting cast includes John Ireland, Donald Curtis, Robert Barrat, Steven Geray, Eduardo Ciannelli, Arthur Space, and, pretty far down in the cast list, Raymond Burr, his fifth film in a career which started in 1946. Mary Adams Hayes and Karen X. Gaylord appear in an amusing scene as waitresses. The underappreciated Franchot Tone brings to Stu Bailey the same lighthearted spirit seen as the Western detective in TRAIL OF THE VIGILANTES (1940). Things may get tense and even dangerous, such as when there's an attempt to run him down in a deserted industrial area, but he keeps his cool and is always ready with a quip. There's definitely some foreshadowing of Jim Rockford here, over a quarter century before THE ROCKFORD FILES. The movie is good fun and I would happily watch it again; alas, it's not available on DVD or even VHS. It can currently be found on YouTube in a murky print with a slightly mismatched but clear soundtrack; sadly, the print looks nothing like the lovely 35mm print from Sony we saw last night. I very much hope this Columbia Pictures film shows up one day on a restored DVD so that it may be enjoyed by a much wider audience. 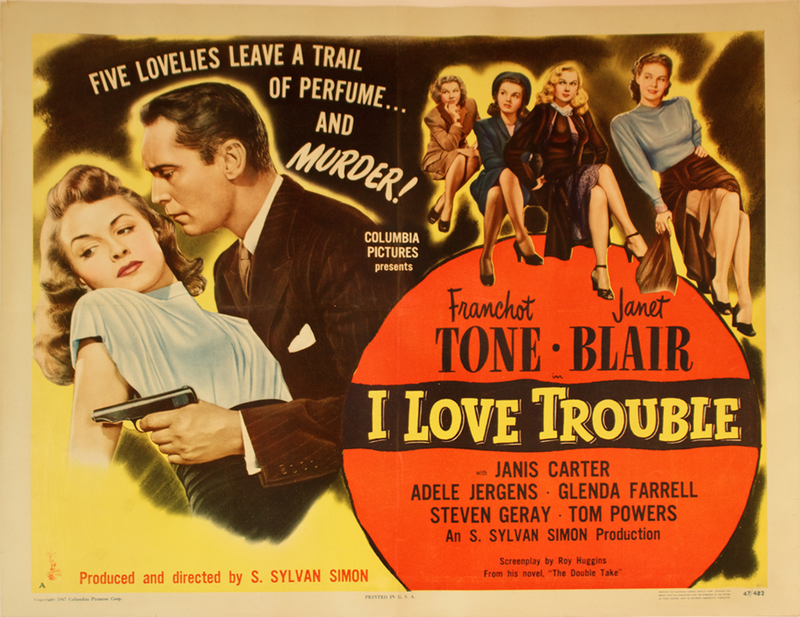 I LOVE TROUBLE was directed by S. Sylvan Simon, who would pass away too young in 1951. Simon was only in his 20s when he made numerous entertaining "B" films for MGM, including SPRING MADNESS (1938), THESE GLAMOUR GIRLS (1939), and DANCING CO-ED (1939), to name just three fondly recalled movies. 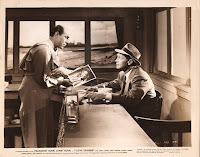 The movie was filmed in black and white by Charles Lawton Jr. It runs 93 minutes. Coming soon: A review of L.A. CONFIDENTIAL (1997), seen Saturday evening. This sounds fun, Laura . I'll check it out on YouTube. A shame it's not on DVD. And a cast full of names we know. 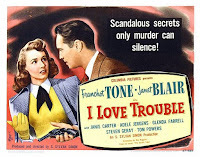 I watched "I Love Trouble" tonight, thanks to your review and for Youtube. You're right the story was hard to follow with so many twists and double twists. But most confusing to me, at least, were the women in the movie. They all looked alike!! I couldn't tell one babe from another, the only one that was different was Glenda Farrell, least I recognized her each time she appeared. All the rest of the ladies just looked like twin sisters of each other, except for the one platinum blonde in the movie. But, Tone's attitude and slog thru it all attitude was good. In spite of all the gals appearing to be standing in a multi-reflecting mirror I did enjoy this movie. 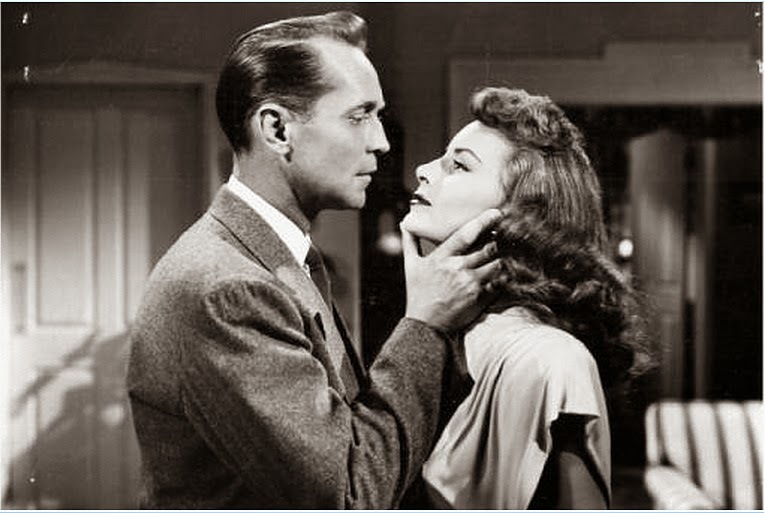 But then I like all film noir B-type movies like this. They are the closest thing to real life. Hope you can see Mr. Ladd at a cinema at some point, Hamlette! He's a movie star in the best sense of the word, his charisma jumps off the screen. I've seen a wee little tiny smidgeon of Shane on the big screen, sort-of, because characters watch parts of it during the movie Logan. Which I didn't know was going to happen, and so the first time I was watching the movie, suddenly here was Alan Ladd's voice in the background and I stopped breathing for about 90 seconds because right there, I had Alan Ladd and Hugh Jackman, Shane and Wolverine, on the screen together in front of me. It was surreal and lovely. They're building an Alamo Drafthouse here in my city, so I'm hoping that means I'll soon have more opportunities to see classics on the big screen. Right now I do get to see some TCM movies at another theater that's about 45 minutes away, but I only can get to a couple of those a year. And they haven't had an Alan Ladd movie on the lineup, at least not since I started caring about him. I don't ever want to hijack comments Laura, but I subscribe to all the ones from here (and a few other fav blogs) and when I read Hamlette's comment I had to say "same here!!" re Logan. That was incredible, seeing all my favourite things (Ladd, westerns, X-Men, Hugh...) collide like that. It really was lovely and added to how emotional Logan already was. Anyway, hopefully you get to see a Ladd movie on big-screen soon, I was lucky to see Proud Rebel at Tcmff and loved it! Thanks, Kristina! I don't think I would have cried nearly so hard over the ending of Logan if they hadn't been using words from the ending of Shane during it. Oh man, I'm getting goosebumps right not just remembering it. So powerful.